It's a fact that having your own product will increase your profit immensely vs. selling someone else's product. But whether you have a product idea or have already created a product, the determining factor of whether it will sell or not depends on your market. How do you know your idea will sell?... Or worse - will it flop? These are all great questions that you need to ask yourself before you jump into any market. So, as you can see - doing proper market research is very important. Yet digging deeper into the market to see what sort of things buyers are saying that they like and don't like is also important. This helps you create a better product or improve your existing one to be exactly what your potential buyers want. So whether you have a product idea you "think will sell" or you've already created one - you'll have the peace of mind that you're doing the right thing. That’s why "Know What Sells" was created – to help you better understand how to examine your market further and to really know what your buyers want (which is the most important aspect). It’s really too easy to create a product around what “we think is correct” vs. putting ourselves in our potential customer’s shoes. It's one thing to KNOW that you need to conduct as much research about your markets as possible. However actually DOING it and applying the knowledge is another thing altogether. 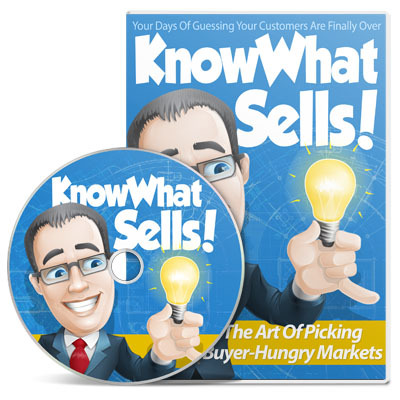 'Know What Sells' strips down and simplifies all these important questions so you can apply them effectively in your business. The end result are winning products that are guaranteed to sell again and again! In this specific video, you're going to get a quick overview of the whole video course itself. We will also dive into the basics so that you have a better understanding of how to begin the process of researching your market properly. Module 2 - What Is Your Product? Do you know the answer to this question? Before you do some market research it's best to have an idea of what it is you do in terms of the service or what product you will want to sell. Of course you want to have a good idea of “why” your customers are willing to purchase it. This will help you get some ideas of how to better reach your potential buyer market. One of the biggest mistakes that we all make in terms of finding markets is focusing specifically on just one market. So, this specific video is going to help open your eyes into the many different types of markets that you can tap into. Before I show you how to properly begin to research your specific markets, I want to give you access to specific sites that give you some information about the possible markets that you're about to go into. We will be looking at specific market data mining sites and resources. Now let's begin to research your market, your competitors, and most importantly what your customers want and don’t want. But of course in this specific video, we are going to focus primarily on market research and your potential competitors. And don't worry, everything is a step-by-step process, so you'll be able to follow me from step one right up to finding the right market. If you want to access to real statistics, then Google itself knows what kinds of keywords people are searching for as well as what kinds of trends the market is moving towards or away from. Therefore in this specific video we are going to talk about finding market trends and getting real hard data instead of simply guessing. Besides searching for market trends, if you want to dig a little bit deeper into your market or your niche, then you’ll want to research keywords to find out what people are “truly” searching for. Now before you jump into any market, it's very important to find out what is selling and what is not. You don’t want to make the mistake of learning that your product isn’t going to sell after you have created it. Fortunately it's not hard at all - in fact, you can use free tools to figure this out. Now, in terms of product research, it would save you tons of cash knowing how to improve your product so that your customers really want to buy it. Therefore you want to figure out what people want and what people don't want in terms of your product. Fortunately you don’t have to re-invent the wheel. In the specific video we are going to use free tools to figure this out. It's important to “find the chatter”. In other words, what I mean by this is to figure out what people are talking about in the market you want to dive into, because if you have an idea of what people are talking about – this can help increase your conversion rate drastically. Do you know why so many new marketers aren't able to build a profitable business online? They are far too busy chasing after that pot of gold that they've heard lies at the end of the rainbow. We know that the shortest path between two points is a straight line, right? So why do we convulute the process and over-complicate things when it comes to building a successful online business as a niche marketer? Whether you plan to develop your own niche information product or you are interested in making money with affiliate campaigns, you always want to venture into markets that are easy to penetrate, have been proven to be profitable and continue to be viable and evergreen over the long run. Act Now And Receive 5 Freshly Written reports With Private Label Rights! These are high quality private label niche reports that will add value to your marketing campaign. Each one comes with their high resolution cover graphic and source document. Take any of one of them, brand them, make them your own and you'll build a strong following of readers who'll know, like and trust you and in no time! A value of $197! Yours FREE! Where there are buyers, there is money to be made. Some of the more profitable niche markets are so obscure and small that they're often overlooked as not being 'viable', when in fact, they are bursting at the seams with avid, hungry buyers! Grab this video course and you'll have the peace of mind that you're going into the right market – and reaching out to the customers who want your product. Yes! Give Me Instant Access To Know What Sells! YES Charles! Give me instant access to Know What Sells! I want to know straight off the bat what sells and what doesn't! Save you massive amounts of time and get me started on the right foot! We make every effort to ensure that we accurately represent these products and services and their potential for income. Earning and Income statements made by our company and its customers are estimates of what we think you can possibly earn. There is no guarantee that you will make these levels of income and you accept the risk that the earnings and income statements differ by individual. As with any business, your results may vary, and will be based on your individual capacity, business experience, expertise, and level of desire. There are no guarantees concerning the level of success you may experience. The testimonials and examples used are exceptional results, which do not apply to the average purchaser, and are not intended to represent or guarantee that anyone will achieve the same or similar results. Each individual's success depends on his or her background, dedication, desire and motivation. There is no assurance that examples of past earnings can be duplicated in the future. We cannot guarantee your future results and/or success nor is this a guarantee of ways to make money online. There are some unknown risks in business and on the internet that we cannot foresee which can reduce results. We are not responsible for your actions. The use of our information, products and services should be based on your own due diligence and you agree that our company is not liable for any success or failure of your business that is directly or indirectly related to the purchase and use of our information, products and services. ClickBank is a registered trademark of Keynetics Inc., a Delaware corporation. Know What Sells is not affiliated with Keynetics Inc. in any way, nor does Keynetics Inc. sponsor or approve any Know What Sells product. Keynetics Inc. expresses no opinion as to the correctness of any of the statements made by Know What Sells in the materials on this Web page. 2019 Know What Sells. All Rights Reserved.